At eight hundred yards away and tucked back in the shade, my buddy Josh said to me, “quit moving”. The rams we were watching had caught the movement of me getting a bottle of water out of my pack. I was sure that he was out of his mind, but a glance through my spotting scope showed that they were frozen and looking in our directions. I was sure that this was a coincidence as we were over eight hundred yards away, we are in the shade and all camo'd up. I opened my pack back up and tossed the bottle of water back in. Josh scolded me like a pup that just peed on the floor and said, “good job, now they’re gone”. I went from being a skeptic and not caring about hunting this exotic African desert dweller to being a raving fan. These ghosts of the desert have some of the best eyes around, a keen sense of smell and live in some of the nastiest country you can imagine in west Texas. This experience took place 8 years ago and ever since then, the last week of March, I’m in Marfa, Texas, hunting these poor man’s sheep with Steve Jones Backcountry Hunts. They call them the poor man’s sheep because a guy can hunt these things for between $2,500 on a do it yourself trespass hunt, up to $8,500 for a fully guided hunt with five-star lodging. Steve’s ranches provide world class sheep and aren’t at the top end of the price scale. Even at $5,500, they are a far cry from spending what you would on the cheapest Dall sheep hunt or let alone a $50,000 desert bighorn hunt. So, you get all of the characteristics of a sheep hunt at a fraction of the cost, as well as something to do in the off season. This year, we had given away a trip in our Pro Membership Sweepstakes that was specifically for those members who work hard to recruit other members. For every three members they recruit, they get another five tickets in the main drawings, but we held a special drawing for just recruiting members. When we held the drawing, there were 22 tickets in that drawing and Mike Schaefer from California was the lucky winner. When I called to let him know that he had won, he was overjoyed, but had no idea what an Aoudad or Barbary sheep was or where they came from. Needless to say, it was not on his bucket list as I told him about my first experience with these things, which quickly piqued his interest. A few days later, after a little more research, Mike called and seemed to be a lot more excited about the upcoming hunt. March 23rd finally arrived as the Sportsman’s News team met up with our lucky winner. Steve Jones as well as Dave Calloway, his long-standing guide, were there to share the experience as well. We shot the rifles to make sure TSA hadn’t messed with Mike’s zero and we then took off from the ranch house for an evening hunt. Both Steve and Dave have a lot of experience at finding these sheep and I always work hard on my glassing to try and beat them at finding the first shooter ram, but you guessed it - I lost once again. Steve had picked up a band of rams at just over a mile away and they were in a really good place to make a move on them. We still had a little over an hour of daylight left once we drove to a good place to stash the truck. Steve and I stayed back while Mike and the two other camera guys moved in for a closer look. As the guys slipped behind the hill for cover, I had an open view of the rams and there were two tremendous rams that were creeping up on that 30” mark, which is the true giant. They were sparring and pushing each other around, which had the whole group distracted. I was sure the guys were going to get a shot at them once they came over the top of the ridge. From my position, it appeared that they should be just around four hundred yards, but by the time the group peaked over the top, the band of rams had rolled over the top of the hill and were out of sight. There wasn’t enough daylight left to make another move on the group. The next morning, we were back on a lookout spot which gave us a great vantage of the hill the band of rams were on the night before. Unfortunately, we couldn’t turn them up. As the morning sun lit up the rocky west Texas landscape, sheep were visible everywhere. It was truly one of the best mornings of spotting I’ve ever experienced and we were able to look over a hundred different sheep. We set up the gun on a pretty good group of rams and Mike was starting to make a serious consideration for taking a five-hundred-yard shot, but unfortunately, we didn’t see anything close to the caliber of rams we had seen the night before and decided that lunch and a midday siesta might be in order. It took several hours of spotting in the later afternoon to dig up a group of rams. The hot sun had these desert dwellers holding tight, but Dave will always find you one if you give him enough time. Once again, there were several good rams in this band of fifteen or so. They were definitely worth a closer look. After about an hour of hiking, the guys could be seen cross canyon and eating the sun. It was obvious that there were several shooters in the group but keeping track of them and communicating between the camera crew, shooter and guide proved to be a daunting task. Mike finally got a clear shot at a ram he felt was worthy of his tag, so he took aim and squeezed the trigger. Boom! The group started to panic because no one but Mike was sure what ram he had shot, but Mike whispered, “I spun him around and he went down”. Unfortunately, the close-up kill shot didn’t get captured for the show and even worse was that when the group hiked over to the next ridge, they couldn’t find any blood. It was a long night back at camp and as hard as we reviewed the video footage, we couldn’t tell anything about the shot. The next morning couldn’t come quick enough for Mike Schafer. Everyone hiked up to the spot where the rams were the night before and our group was about to throw in the towel, when Andrew (cameraman) found a small drop of blood on a rock. We at least knew the ram had been hit, but there was no telling how fatal the shot was. We followed the blood trail for over a half a mile and in some places, it was on hands and knees, which is usually a bad sign. Suddenly, Dave spotted the top of his horns bedded about a hundred yards down the hill and he was still alive. Everyone quickly set up for a finishing shot and as if on cue, the ram bolted from his bed. Mike made a fantastic running shot and the team captured it all on film. Mikes original shot had hit the ram back from what would be an ideal shot placement, but it slowed him down and Mike was ecstatic with his first Aoudad. His comment about the hunt and the excitement it created for him was, “this truly is a real hunt and I will be back”. 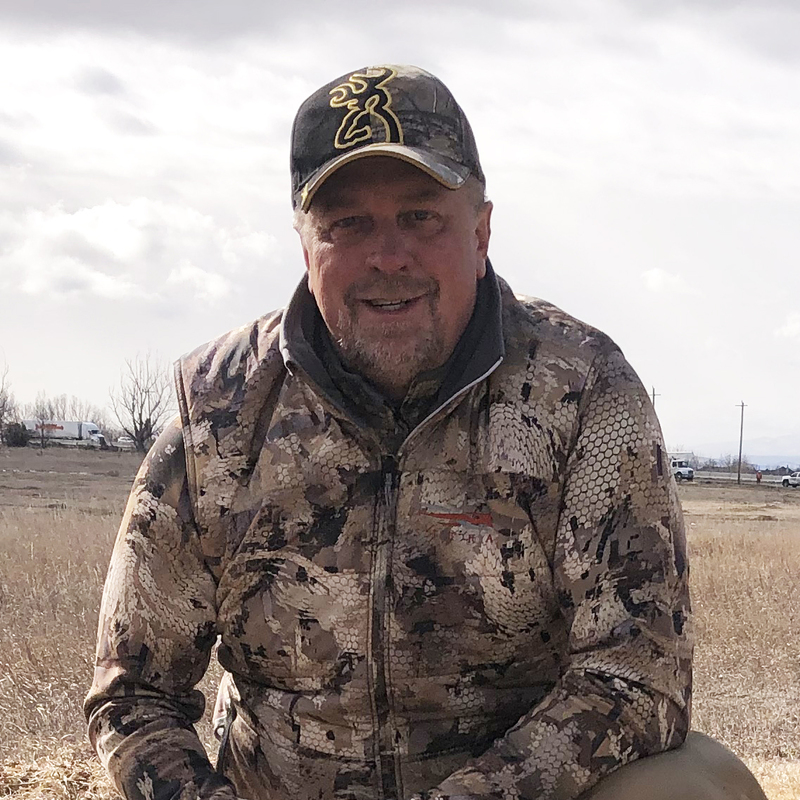 Steve Jones only does about a dozen of these hunts a year and the Sportsman’s News Team always reserves one for our Pro Membership Sweepstakes. To become a member enter to win one at www.promembershipsweepstakes.com or you can book your own adventure at www.backcountryhunts.com.